FeastHome – A kitchen cabinet or kitchen rack is able to be used to store any kitchen elements such as tableware, kitchen tools, kitchen pots, and even spices. But for you who want to separate the spices with your collection of kitchen utensils or tableware, you need an additional storage. 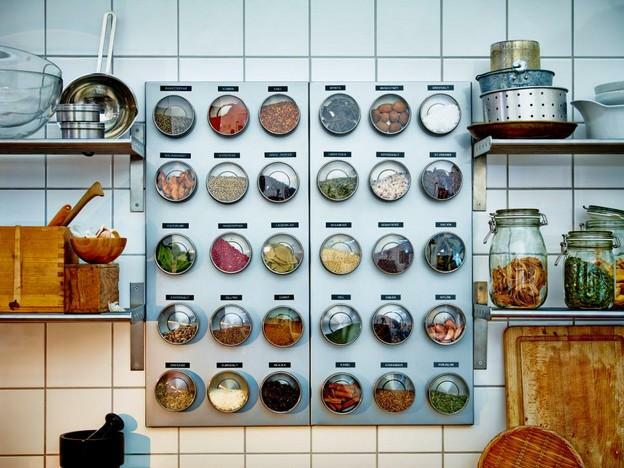 If you are looking for some ideas of storage solutions for spices in your kitchen, check these inspirations below. 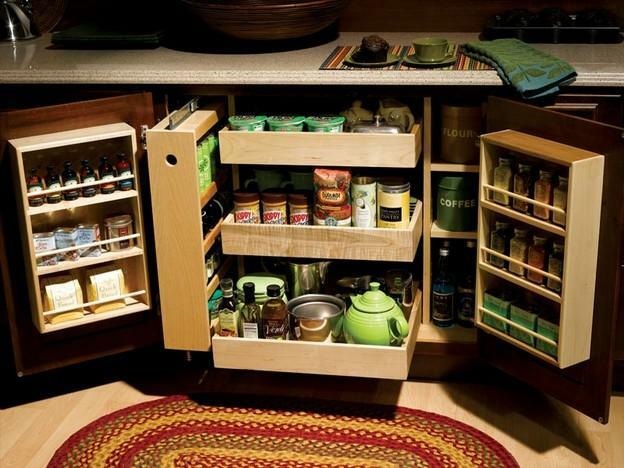 This storage for spices is suitable for you who have a lot of spices in your kitchen to be stored. This storage consists of many covered bowl so that you are able to neatly save your spices. Using this kind of storage will make it easy for you to find the spice that you need for cooking and it is very practical. But, make sure you have a quite large area in your kitchen if you want to have this type of storage because it is pretty large. 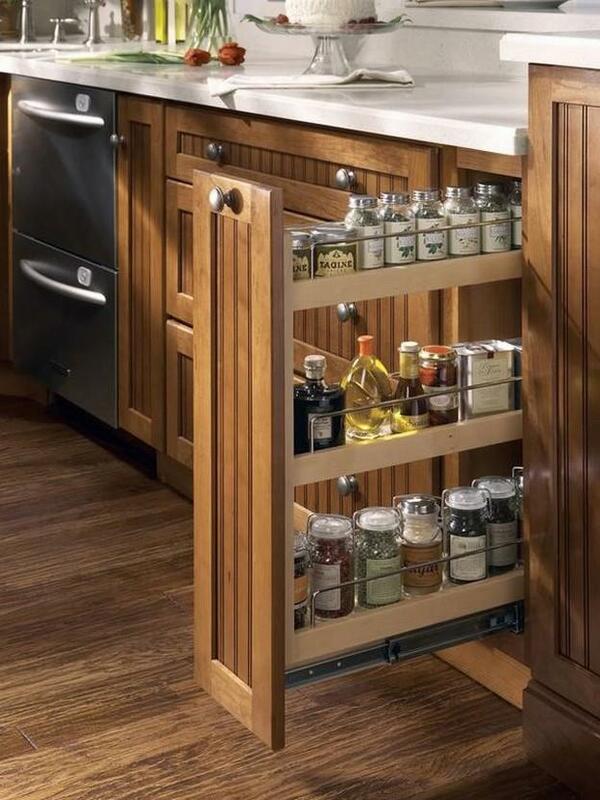 This storage will make your kitchen to be at the center of attention. 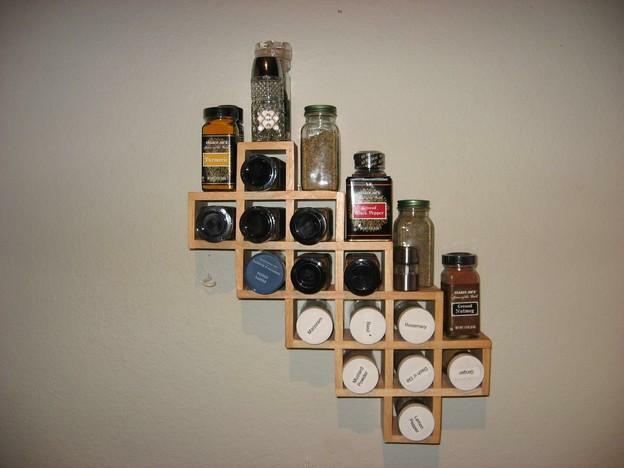 For you who want a simple storage to place your spices, this idea is a perfect choice for you. This storage is made from a wood material which is quite strong and durable. The faded black color brings an old and traditional touch to your kitchen. Every rack is installed in a different height so that you can place your spices depend on the height of the spices bottle. Some hooks are added at the bottom part of this storage in order to hang up some kitchen utensils such as a grater and cup. This way, you will have an additional storage for your kitchen tools. Hands up for a wood lover! This wooden kitchen cabinet matches perfectly with the natural patterned wooden floor. A wood material is pretty strong and durable as long as you do a regular treatment. Some wood materials are even resistant to bugs and rots. Choose a high-quality wood material so that it can last for a long time. The wooden sliding cabinet in the picture above is slim but provides enough spaces to store many spices. The slim design also brings a minimalist touch to the kitchen area. 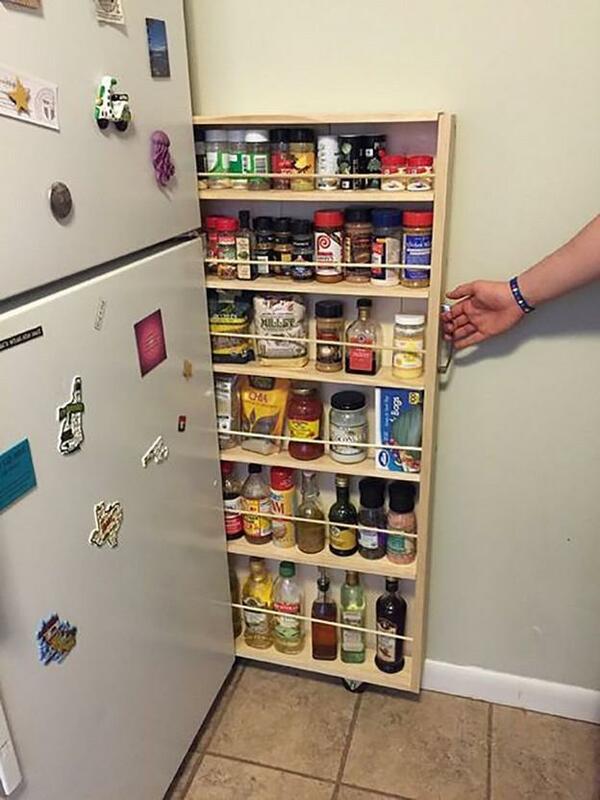 If you have a lot of kitchen cabinets and want to use it to store the spices, you can follow this idea. The householders use a lot of clear plastic jars as a storage to save the spices and put them in a kitchen cabinet. The kitchen cabinet itself is divided by some partitions so that the plastic jars are neatly stored. You are also able to use other types of jars such as a glass jar or aluminum jar. Choose the one which is suitable for your needs. Are you looking for a storage which is able to save spaces in your kitchen area? Then, the storage in the image above can be your solution. This storage is installed in a small space beside the fridge so that a hidden and space-saving storage is created. Even though the width is very small, but the height of this storage is quite tall so that enough spaces to save the spices are still provided. This hidden storage is equipped with a handle and wheels in order to make it easy to pull it. This kind of storage for spices is suitable for a small kitchen area. This type of storage is able to be a kitchen wall decoration at the same time. It is because this storage is designed in a unique shape. Quite a lot of spices are also able to be stored in this shape. The wood material used for this storage is strong enough to hold the bottle. Moreover, it also acts as an open storage which is suitable for you who want to easily take out the spice that you need. You are able to create a secret room inside the wall in your kitchen in order to have a hidden storage just like you can see in the picture above. 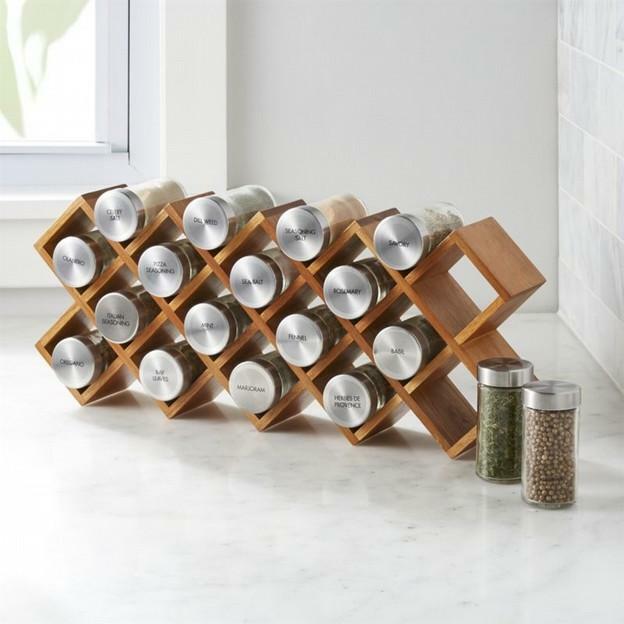 This way you can protectively store the spices in your kitchen. 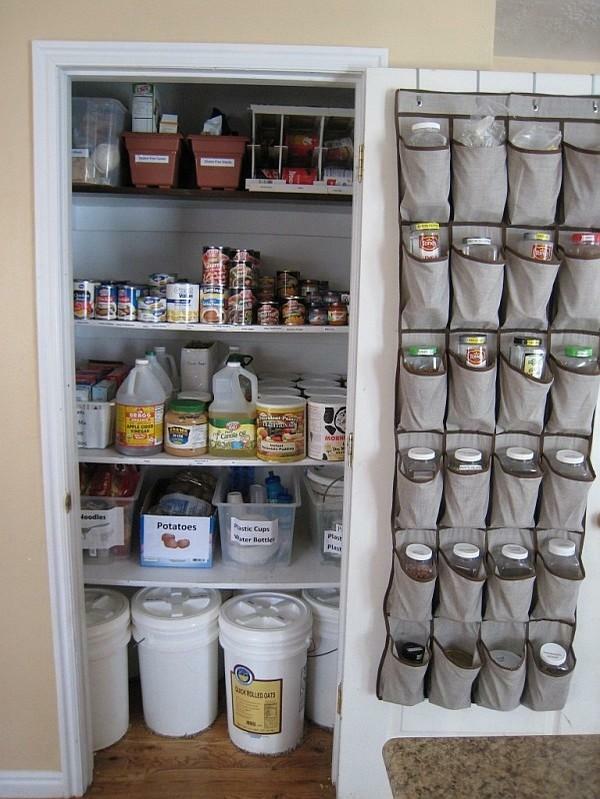 If you need more additional storage for your spices, you can use a cloth storage which is usually used to place shoes. Look for a secondhand cloth shoe rack in your house and take a benefit from it by using it as a storage for your spices. It is a great idea to save some money. Do you want to have storage for your spices and kitchen decoration at the same time? This shaped wooden storage can be your solution. This storage has many diamond shapes that are formed into one decorative shape. Store your spices in the glass jars and put them in this storage just like in the image above. So that the storage looks more attractive and decorative. Moreover, the wood material used will bring a warm and natural touch to your kitchen. This wooden kitchen cabinet contains other wooden kitchen cabinets inside it. This kind of storage is suitable for you who search for a unique storage to store the spices. This storage provides a lot of spaces so that it can save many things not only spices but also coffee, oils, jams, flour, and even a pitcher. 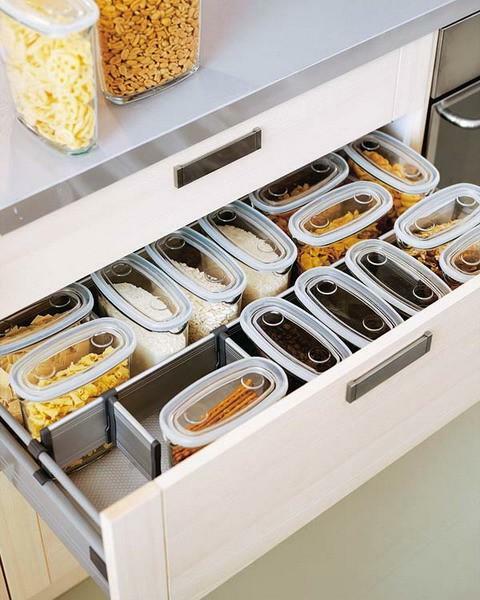 If you use this storage, your kitchen area will look clean and neat. 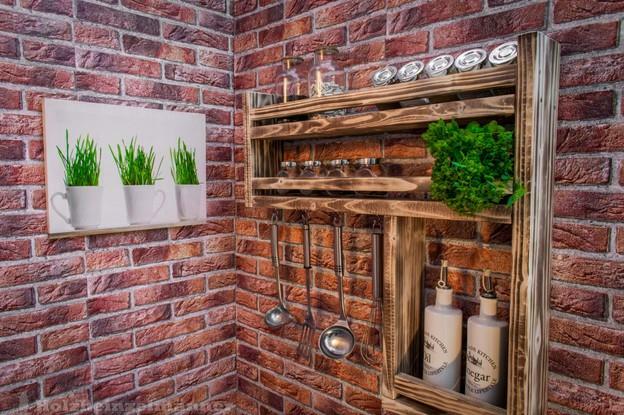 This wooden storage blends perfectly with the brick walls, creating a traditional farmhouse look to the area. It does not have many spaces so that it is perfect for you who do not have a lot of spices to be stored. But some hooks are installed below this storage so that the kitchen tools can be hung up there, creating some additional storages. 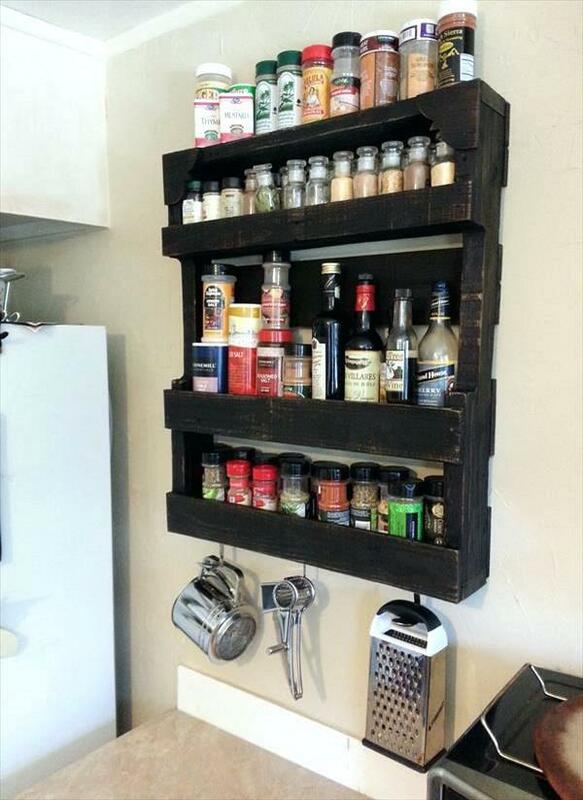 Those are the ideas of modern storage solutions for spices. Learn How to Change Your Kitchen Right Now!